Brown meat with onions in large saucepan on medium-high heat. Add celery, red peppers and green peppers; cook 8 min. or until crisp-tender, stirring occasionally. Stir in chipotle peppers, garlic and chili powder; cook 1 min. Add tomatoes and beans; stir. Bring to boil; cover. Simmer on medium-low heat 15 to 20 min., stirring occasionally. Have leftovers? Cool leftovers, then freeze in airtight container up to 4 months. Thaw overnight in refrigerator, then reheat just before serving. 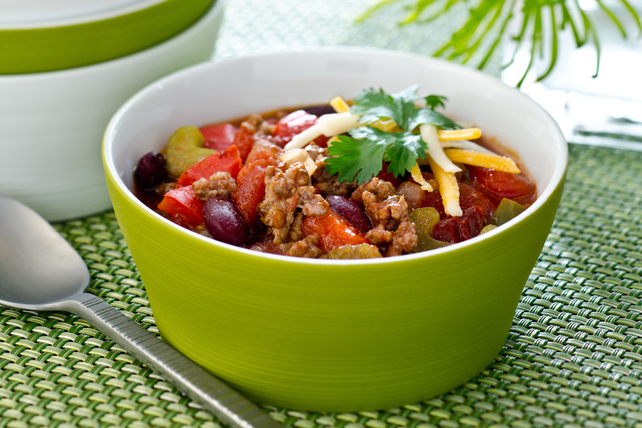 Enjoy a little taste of Mexico with this delicious chili dish. As a bonus, the tomatoes provide an excellent source of both vitamins A and C.